This painted metal flower was a true “challenge” in every sense of the word. 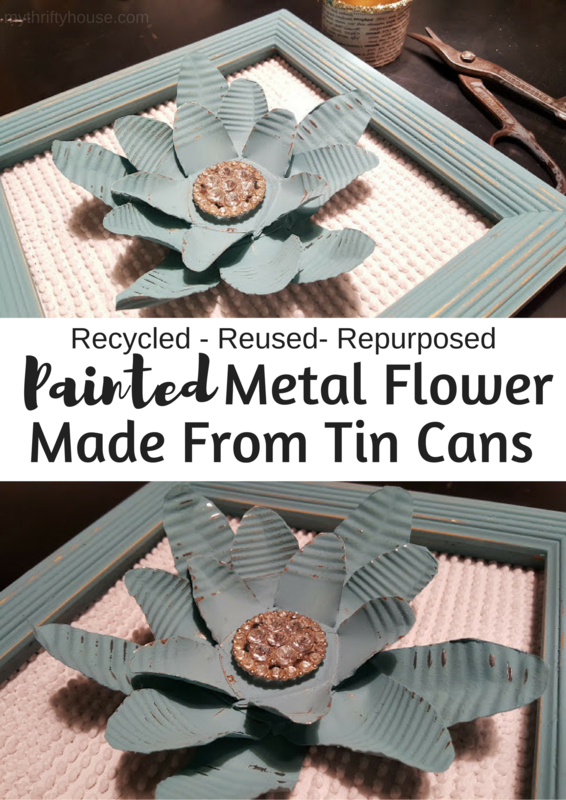 My friend Toni from Small Home Soul challenged me to make something from a tin can for our weekly Waste Not Wednesday post. Of course, my mind immediately went to the ole’ tin can covered with string project that I made for my Mom when I was in Girl Scouts. Granted my crafting skills have since improved but I am sure I can rock a string covered tin can like nobody’s business these days. 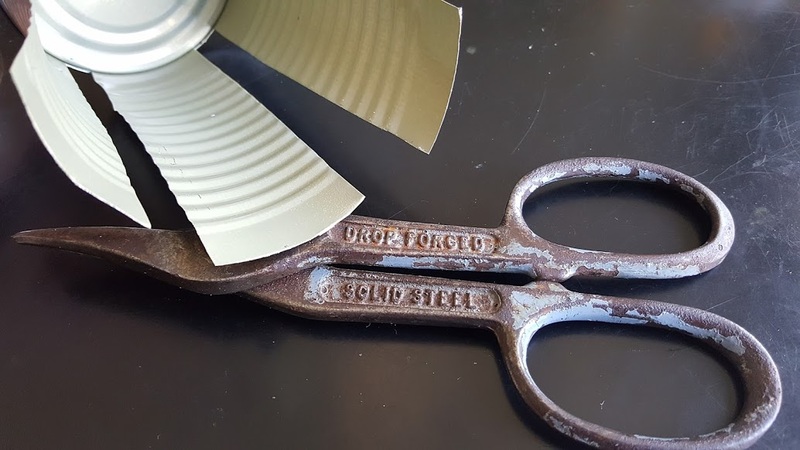 Then my hubby used the tin snips to cut the can into 5 sections that would become the flower petals. He then folded the petals down and hammered them flat. I drew flower petals on each piece and no I didn’t measure them either. I think it makes them more interesting if the petals aren’t uniformly cut. 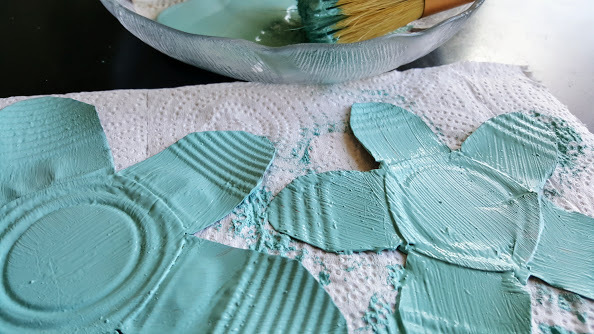 After the flower petals were cut he sanded the rough edges with a sanding block. Next, I painted each side of the flowers with two coats of my homemade aqua chalk paint that was left over from my baby doll bed makeover. 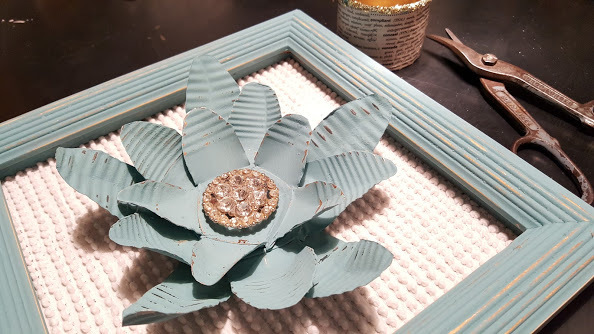 I lightly sanded the flowers to highlight the ribbed lines of the tin cans and give it some depth and texture. I then curled the metal flower petals to give it some dimension. 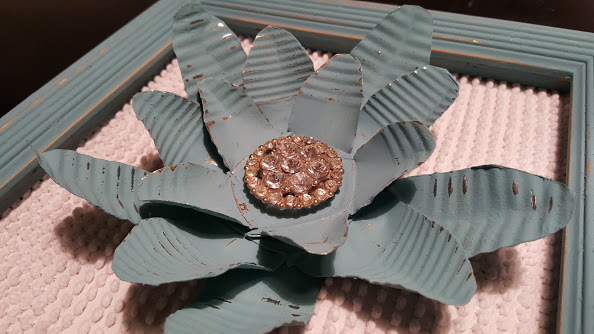 Lastly, I added a piece of rhinestone costume jewelry to the center of my painted metal flower. It’s no surprise that I was able to find a square frame in my craft room stash. I painted the gold frame with some of my homemade aqua chalk paint, distressed it with some sandpaper and lined the back with a scrap of leftover material used to make my chenille pumpkins this past fall. I attached the painted metal flower to the center of the frame and this beauty will be hung on the gallery wall in my Farmhouse Kitchen. 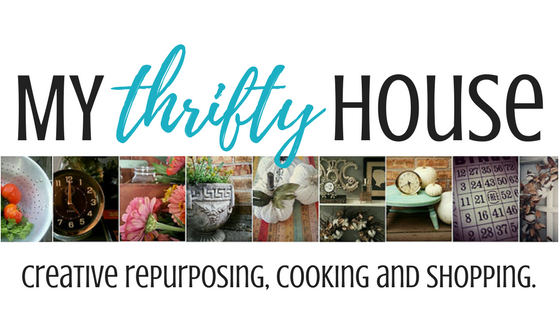 This entry was posted in DIY Projects, Home Decor and tagged chalk paint, recycled, repurpose. Wow, Denise! what a great idea!! I never would have thought of it! Thank you Kellie. I am quite impressed with your tin can project too. Hahaha…..thank for the challenge Toni…you really stretched my creativity. BTW…I love your project too. 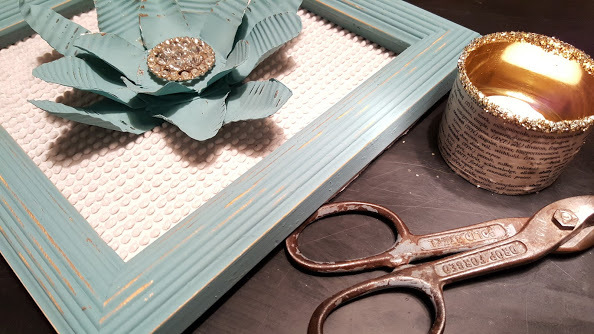 I love a tin can craft and this is a great one I have pinned it to my repurposed tins board. Thanks for stopping by Claire and for sharing too. Thank you Angie….this is my favorite “go to” color. Super love this! Going into “things to make for spring” list! 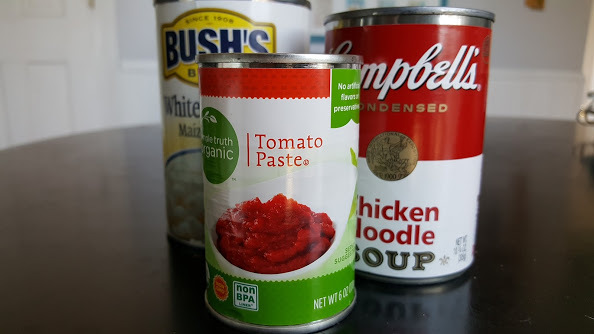 Now to save some tin cans…. Yea….make sure you tag me Kristie…can’t wait to see your version. Wow!! It is so pretty!! This is such a cool Idea! 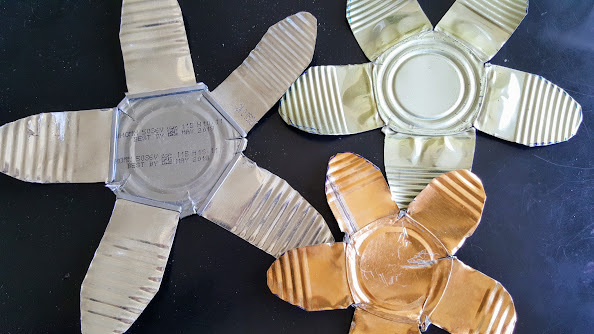 What a great tin can project! 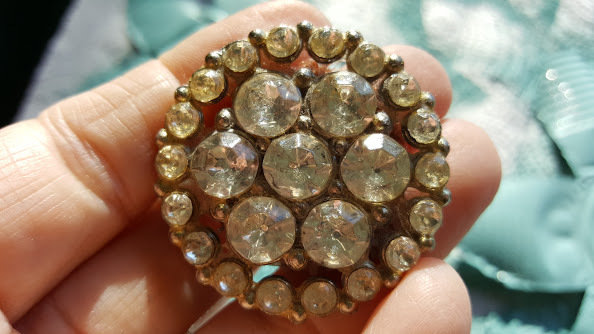 I love the costume jewelry center , that is going to look amazing on your gallery wall!! Thank you for sharing with us at our first ever Create and Celebrate!! Wow, this is unbelievable. This looks like lots of work but you would never guess the flower was made from tin cans. Thank you Debbie. I wanted to do something different and challenge my imagination too. I have been stuck lately. This post has peek my interest in sharing some projects again. Thank you for participating in TADA. You inspired me! Karen….so glad I could inspire you. Get crafty and get those creative juices flowing. I’m pretty sure I would have made a trip to the emergency room attempting a project like this. Your project turned out lovely. You are too funny…..and me too. That’s why my silent partner did the tin snipping portion of the project.